Summary: One of the easiest DIY projects, reversing the effects of a saggy sofa is both cost-efficient and beneficial for you and your family. After a period of long usage, your couch may look and feel older. 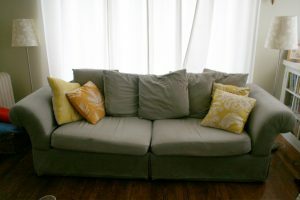 While most folks will tend to throw it out and shop for a new one to replace it, you could save a substantial amount of money by swapping out the sofa seat cushions instead. These days, couches aren’t exactly the cheapest thing out there – quality ones start out in the thousands. This guide is designed to help make your couch cushion backs as sturdy as it once was when you first purchased it. Replacing your sofa chair cushion is much easier than you think. The primary roadblock that you need to deal with is placing additional filling inside the cushion backs. Now, most couch cushions are designed with a plush fill insert. Simply add some plush filling inside your cushion back to easily get them back to its original state. If your cushion has zippers, your job is that much easier. Depending on whether or not your couch cushion fills have a casing or shell surrounding it, simply add the new filling inside. On the other hand, if your couch cushion has a shell, you’ll likely need to cut a tiny slit in the casing to add the filling. After doing so, stitch the slit back together. Adding a layer of batting around the existing cushion can easily reverse sagging couch cushions. Simply remove the cushion from the cover and determine whether or not it’s still in good condition. Then, take out the batting, roll it out, then place the old cushions (or new cushions) on top. Be sure that you trace the cushion around the batting so it fits snug. Once the measurements are accurately taken, place an adhesive spray between the layer of the batting and the cushion to prevent it from sliding around when you’re placing the cushion cover back on. After the adhesive fully dries, carefully put the cover back on the cushion. Your cushion should look as good as new! While it may seem like you can repair a damaged couch, you need to be cautious about doing so. If it’s just the cushion itself, it’s not too much of an issue. But, if it’s the couch frame that’s broken, it doesn’t matter what you replace on top, it’ll still be wobbly and perhaps dangerous. A broken frame could collapse at any time and cause serious injury to the user when he or she least expects it. To counter this, have another person help you lift the couch to its side and inspect the frame itself. Check for cracks, uneven sections, and broken parts. If anything seems to be out of the ordinary, you may not have a choice but to replace it with an entirely new model.